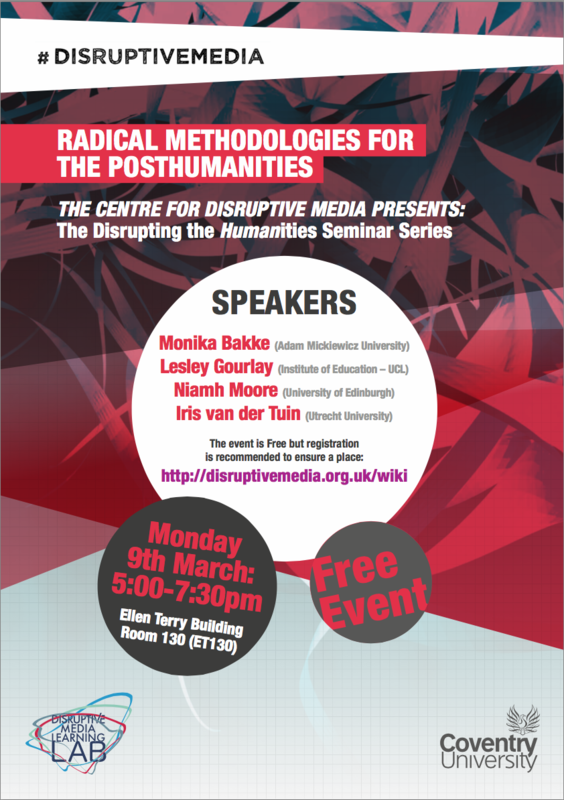 A series of 3 half-day seminars looking at research and scholarship in a ‘posthumanities’ context, organised by the Centre for Disruptive Media at Coventry University. Disrupting the Humanities will both critically engage with the humanist legacy of the humanities, and creatively explore alternative and affirmative possible futures for the humanities. This seminar will focus on some of the radical methodologies that are questioning the established disciplinary forms, methods and practices of the humanities. It will explore how these emergent methodologies are finding ways of moving beyond the humanist emphasis in the humanities on the individualized creative human author, originality, intellectual property, the fixed and finished object, writing and the book. In doing so this seminar will provide a space for thinking further about the distributed, heterogeneous, humans, nonhumans, objects and non-anthropomorphic elements that are collectively involved in the creation, circulation and performance of ‘humanities’ research and scholarship. To provide just one example, in the case of an ink on paper and card book, this would take in most obviously its publishers, editors, peer-reviewers, designers, copyeditors, proofreaders, printers, publicists, marketers, distributors, retailers, purchasers and readers. But it would also embrace all the other ‘multiple connections and lines of interaction that necessarily connect the text to its many “outsides”‘ (Rosi Braidotti): those concerning the labour involved (e.g. that of the agency workers, packers and so-called ‘ambassadors’ in Amazon’s warehouses), the financial investments made, the shipping and container costs, the environmental impact, the resources used, the plants, dyes, oils, petroleum distillates, salts, compounds, pigments and so on. In the dynamic ‘meshwork’ (Tim Ingold) of ‘intra-actions’ (Karen Barad) between the human, the animal, the environment and technology that constitutes the University in the 21st century (including all the associated software, code, data and algorithms, their physical supports and material substrates: wires, chips, circuits, disks, drives, networks, airwaves, electrical charges etc. ), who or what is it exactly that produces knowledge and that can know? What does the use of networked digital media, devices and platforms mean for our methods and the way we carry out research? How do they constitute and mediate its means of production and communication? And if knowledge and research are the result of complex processes involving both human and non-human objects and actants, what does this mean for politics and ethics? In short, how can we perform knowledge-making practices differently, to the point where we actually begin to take on (rather than take for granted, repress or ignore) the implications of the posthuman for how we live, work and act as academics and researchers? What can the humanities become in all these entangled constellations?